In a 45-minute address, the Communist party chief vowed to throw his weight behind a global construction spree stretching all the way from Asia, across Europe and Africa, to the Americas. “The Belt and Road initiative is rooted in the ancient Silk Road … but it is also open to all other countries,” the Chinese leader said, promising to pump $125bn into the scheme. Just as Chinese traders and explorers such as Zheng He, a Ming dynasty navigator, went out into the world in peace, so too would China now seek to engage with other countries. “These pioneers won their place in history not as conquerors with warships guns or swords but are remembered as friendly emissaries leading caravans of camels and sailing treasure-loaded ships,” Xi said. What does the future hold for ‘the west’ on a 100 year or more timescale? If there is infrastructure to be built in places like Europe and Australia then why hasnt these countries bothered with it? Will manufacturing jobs ever return with robotics & automation? Is debt to somewhere like China the future? Is the future bright ? The history of China is the history of it’s Emperors. The present CP Emperor is outward looking, hence the building projects and overseas trade. The Emperors after Zheng He’s voyages weren’t as outward looking and destroyed the exploration fleets and became very insular. There are also internal divisions in China that could cause it to slow down too. I highly recommend “Why the West Rules, for Now” by the archeaologist Ian Morris who takes a long view evidence based approach towards human development in the west and east. As Tulip mentioned China’s internal divisions were as much a problem for its development as intrusions from outside. One practice that sticks out is how when a new dynasty came to power it would disassemble the entire palace building complex of the conquered empire and move it to the new seat of the conquerer! The mandate of heaven had deserted the usurped so therefore the capital of power must move too. Now that mandate sees China reach out into the world again. I’m guessing it’s killing two birds with one stone. First it expands global prosperity and trade which will definitely benefit China in terms of markets for its goods and services. Second it expands China’s political reach especially in Asia where it feels it is the rightful dominant power. Overall I don’t think it’s a bad thing for most of the countries who usually could do with better trains, roads, bridges and ports and they don’t tend to have the financing or construction wherewithal to make these a reality. I’m not sure how much it benefits China compared to spending their money internally but it may work out all the same as they generate returns for their own companies, employment for their own people and spend foreign currency on it. China has wasted billions of dollars and many projects previously so even if half of it is ‘productive’ they will probably count it as a success. Hey it beats bombing countries to smithereens or putting it all into military investments! It is true that at the moment China see itself on a rising grand arc (literally called China Rising 中國崛起). As long as the economy is okay they can spurge on these kinds of initiatives. I agree, it appears to be a good strategy. It’s building alliances and markets that are not under the control of the west. The thing is, once it’s built it has to be maintained so that’ll soak up the excess that is being produced by China now. China’s approach is three-fold: first, build economic alliances to underpin diplomatic/political alliances, and entrench their position in their ‘sphere of influence’. Second, use these links to ensure a ready supply of the raw materials (and food) that China needs. Third, (as others have pointed out) use external investment as a way to soak up excess production and insufficient domestic demand. China’s advantage - apart from its size and economic muscle - is its ability to act without much in the way of domestic restraint. Its leadership also takes a very long view. Its weakness is however inherent in that same strength; a lack of checks and balances, corruption, a weak rule of law etc. You have to admire the simplicity of the plan and the scope of their ambition. Using 19th Century technology to link markets and tie them to China. All without a shot being fired… so far. It appears to be some form of PPP with the Chinese being the private part. …China’s role is another crucial factor in Africa’s railway renaissance. Beijing is financing and building most of the standard-gauge lines across the continent and officials say it is hard for anyone else to compete. The test will come when some local faction, opposed to the sitting government, decides to ‘interfere’ in the railway. Will they have China to answer to ? In fairness, the USA has shot it’s way to influence, whereas China is taking a trade-based approach. Only time will tell which one is more effective, but I think we all know which approach is preferred. The thing is, if the railways are the means by which wealth is brought into the Country, do you want to endanger your future spoils of war by destroying it. After you win, you still owe the Chinese for it’s construction cost. If you renege, the Chinese upsticks and persuade the other parts of the rail network to up tariffs to repay the Chinese. Whose sphere of Influence is east Africa? The Sahara and Central African regions are mostly French. Djibouti is French too. The French can be quite mendacious when it comes to Africa. Any threat to the Chinese plan will come from the West. Djibouti is very small, and In addition to the French, the US has it’s only full time military base in Africa there. Other countries with military bases in Djibouti include, Spain, Italy, Saudi, Japan, and China. Go figya! …If in 2018 Duisburg is slowly rediscovering its cosmopolitan past, it is not just because four centuries after Mercator, traders are still trying to find the most direct route from A to B. As the threat of Donald Trump’s tariffs and Brexit-related trade barriers is driving wedges between the EU and the Anglosphere, this former rust-belt town town allows one to see in real time how Germany and China are intensifying their economic ties. Every week, around 30 Chinese trains arrive at a vast terminal in Duisburg’s inland port, their containers either stuffed with clothes, toys and hi-tech electronics from Chongqing, Wuhan or Yiwu, or carrying German cars, Scottish whisky, French wine and textiles from Milan heading the other way. In Duisburg’s port, where train tracks run straight to the edge of the Rhine River, goods are loaded straight on to ships, stored for further dispatch in one of several football pitch-sized storage units, or sent on by train or truck to Greece, Spain or Britain. …The trains’ return journeys, however, remain Duisburg’s achilles heel. For every two full containers arriving in Europe from China, only one heads back the other way, and the port only earns a fifth of the fee from empty containers that have to be sent back to China. Any threat to the Chinese plan will come from the West. The now familiar ‘suffering peoples’ has been exported to Burma and the Rohingya people. 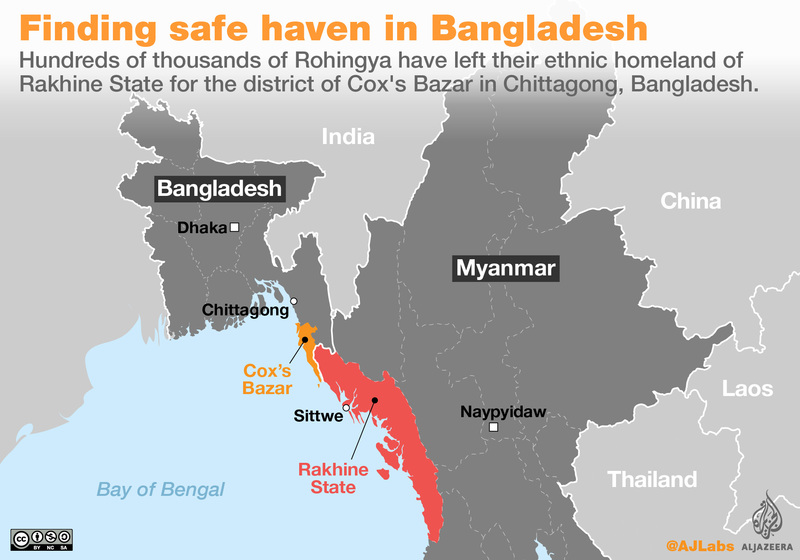 As this link and map illustrate, the desperation of the West to prevent a ‘Western’ Chinese port on the Eastern Indian ocean (thus avoiding the Malacca Straits and a huge sea journey) is key to the misery of the Rohingya. Access to the ports of the Rakhine state in Burma/Myanmar allows the Chinese a much, much quicker and more secure route to export and import over land. So you’re saying the west are going to use the Rohingya to start a war with the Myanmar government to stop China from getting a port there? What advantage would this give them over having a port in Pakistan?